TBT: Leonard Cohen, "Bird on a Wire." Leonard Cohen, the Bard of Montreal, turned 81 this week. He is a poet, songwriter, singer, and novelist (Beautiful Losers). I first knew of him from listening to Judy Collins sing his "Suzanne" on WBCN in Boston during my law school years. It almost made me want to be Canadian. The clip above shows him doing one of his most popular songs, "Bird on a Wire," and a favorite of mine, live in concert in 1979. While he'll always, and rightly, mostly be remembered as a Yankee. the photo shows him as I like to remember him, as one of my beloved Mets. 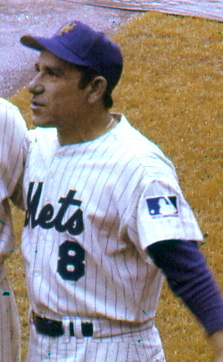 He's shown as a first base coach in 1969, the year the formerly lowly Mets went all the way. In 1965, along with coaching, he had donned catcher's regalia and called a few games for them. He became their manager after Gil Hodges' death in 1972, and led them to a National League pennant in 1973. Midway that season, the Mets were in last pace in their division. A pundit asked Berra if the season was over for them. He replied with what has perhaps become the best known of his many memorable quotations: "It ain't over till it's over."